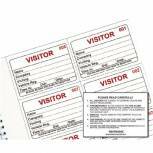 Durable Visitors Book Refill (Pack of 100) 1464/00 Pack of 1 Durable Visitors Book Refill - 100. Each pad contains 300 easy to complete badge inserts and a time out sheet ensuring accurate tracking of visitors. The refill pad is suitable for use with the Durable-100 Visitors Book (see DB10089) or by itself. 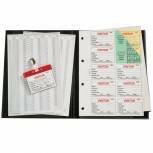 Identibadge System Visitors Book Refill (Pack of 300) IBRSYS300 Pack of 1 Refill for the Identibadge Visitors book. Dual system provides protection to your business. Provides a badge for identification in your business. Helps prevent theft and fraud in your business. Quality paper allows you to write with clarity. 300 inserts. 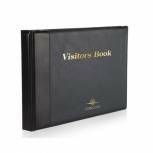 Identibadge Complete Visitors Book 100 Insert IBVBSYS Pack of 1 The system visitors book with padded cover provides for visitors to sign in completing the badge card insert in duplicate. The second copy is retained in the book while the top copy forms the insert for the badge. Complete with 100 inserts. 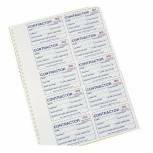 Identibadge Visitors Book Refill (Pack of 100) IBRSYS Pack of 1 Refill for the Identibadge Visitors book. Dual system provides protection to your business. Provides a badge for identification in your business. Helps prevent theft and fraud in your business. Quality paper allows you to write with clarity. 100 inserts. 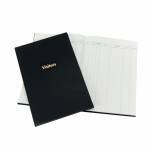 Durable Visitors Book Refill (Pack of 300) 1466/00 Pack of 1 Durable Visitors Book Refill - 300. Each pad contains 300 easy to complete badge inserts and a time out sheet ensuring accurate tracking of visitors. The refill pad is suitable for use with the Durable-300 Visitors Book (see DB10092) or by itself. 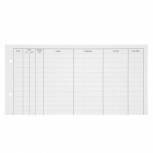 Guildhall Loose-Leaf Visitors Book Refill (Pack of 50) T40/R Pack of 1 Guildhall Refill sheets for the T40 Visitors Book. Each sheet records details of visitors with space for 18 entries per page. Leaf Size: 210x297mm (8.25x11.75). For complete Book see GH01951. 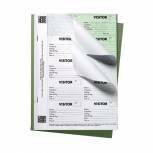 Concord Visitors Book Refill 50 Sheets (Pack of 50) 85801/CD14P Pack of 1 Collect visitor details, company names car registrations and times of visits. 2000 entries per page. Fits to Concord Visitor's books. Loose leafed design. Easy archiving. Ideal for use in reception. 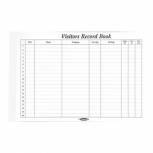 Concord Visitor Record Book Black 85710/CD14 Pack of 1 Records visitors details, name and company, car registration number, badge number, time in and time out. 2,000 entries per binder. Black and Grey loose leaf padded binder with 3 ring mechanism. Binder 230x335mm. 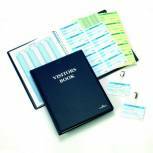 Identibadge Complete Visitors Book 300 Insert IBVBSYS300 Pack of 1 The system visitors book with padded cover provides for visitors to sign in completing the badge card insert in duplicate. The second copy is retained in the book while the top copy forms the insert for the badge. 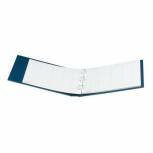 Book with 100 inserts. Guildhall Company Visitors Book 160 Pages Blue T253 Pack of 1 Guildhall Company Visitors Book, an ideal book for reception use. Each book has 160 pages with a leaf size of 298x203mm (11.75x 8.25). Bound in Blue. 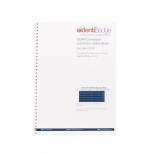 Guildhall Loose-Leaf Visitors Book Landscape Blue T40 Pack of 1 Guildhall Loose Leaf Visitors Book. High quality, heavy grained PVC binder, fully padded with metal corners and a strong 3 ring mechanism. Supplied complete with 50 ruled sheets with 18 entries per page. 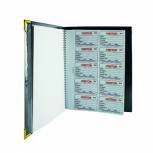 Binder - 236x349mm. Colour - Blue. Identibadge Contractors Management System Duplicate Refill IBCONR Pack of 1 Set to ensure that contractors are visible in your workplace. Duplicate system creates a badge while leaving a permanent record. Allows clear identification. Includes 100 refills. Ensures that temporary workers are known. Collins Leathergrain Visitors Book 192 Pages 40 Pack of 1 Fully cased in leathergrain with attractive Gold blocking. High quality endpapers. 192 pages, each headed: Date, Name, Address, Blank. Available in burgundy, Blue and Grey, packed assorted. 254x203mm (10x8ins). 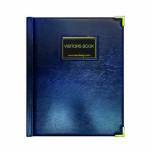 Durable Visitors Book with 300 inserts 1465/00 Pack of 1 Durable Visitors Book - 300. Stylish leather look padded visitors book containing a pad of 300 easy to complete badge inserts. Perforated top copies tear out for insertion into badges while a duplicate copy is retained as a permanent visitor record. 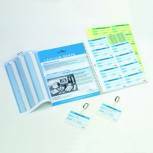 Nobo 25 Page Visitors Badge Slip Book 35334941 Pack of 1 The visitors badge book offers easy security identification for receptionists to administer by completing a tear-off badge insert for each visitor - can be used on its own or with the executive cover. 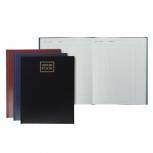 Durable Visitors Book with 100 inserts 1463/00 Pack of 1 Durable Visitors Book - 100. Stylish leather look padded visitors book containing a pad of 100 easy to complete badge inserts. Perforated top copies tear out for insertion into badges while a duplicate copy is retained as a permanent visitor record. 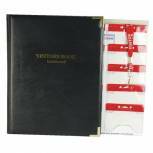 Identibadge Visitors Book Set with Visitor Lanyards IBSSC4 Pack of 1 Visitor book system complete with plastic cover, 100 inserts, 10 red topped badges and 10 visitor lanyards complete with breakaway feature. 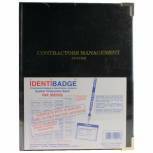 Identibadge Contractor Book Set with Lanyards IBSSC5 Pack of 1 Contractors book system complete with plastic cover, 100 inserts, 10 Blue topped badges and 10 contractor lanyards complete with breakaway feature.